I have always had this feeling that something good just might come out of all of this mess, and with the help of my friend Dennis from the Facebook Support Group for BMS, I think that “something good” may have made its appearance. I have been creating websites for a long time. I never claim to be a professional, but back around 2002, I taught myself enough HTML to be able to create a website for my daughters’ middle school here in Austin. I have always known that a well-designed, easy to use website would be a great boon to public schools, but they are caught in a terrible Catch-22. They need funding and support to create a site, and more importantly, to maintain it. Unfortunately, the people who would be most likely to help fund that sort of thing would also be best alerted to the need by a website! And then there is the challenge of updating when parents and volunteers move on with their kids. Yeah…you get the picture. I jumped in and said I would make one and be their volunteer webmaster. I was looking forward to about five years at this particular school between both girls, so why not? I gambled that in five years, more people would get comfortable with the technology and I could replace myself. It took off like a rocket! The parents, teachers, neighborhood, Realtors and new transplants to the community loved it. We were opening the doors to our wonderful school through their laptop computers and they soon came to depend on it. I had already started volunteering with the Seedling Foundation, and I asked if any of the Austin ISD schools we were serving in other ways could use a website and volunteer webmaster? Within a year or so, I had created and was mastering over 25 sites for low-income schools, the Seedling Foundation and the Austin Council of PTA! I used a combination of FrontPage software and Blue Host as my server and had it down to a tight routine. Then, a few years later, Microsoft discontinued FrontPage, and nothing at the time was as easy to use. I phased out the schools and ACPTA website and Seedling moved their site to Joomla. I trained on Joomla and mastered the new site for them, but it was far too complex to do in bulk. I assumed that would be the end of my web creation career, but this year I became aware of the increased sophistication of the web builder sites on the market. I started experimenting with WIX and liked it very much. Soon the “something good” popped up, (as it often does when you open the doors of possibility). Dennis contacted me and said that the support group would really like a website. First, to raise awareness about Burning Mouth Syndrome, and second, to attract researchers, medical professionals, and sufferers to a place that could explain things clearly and encourage them to help. They plan to form a nonprofit so that they can eventually encourage researchers with more than just data and access to sufferers, but until then, a website could start giving some hope to these hundreds of thousands of people with BMS all over the world. I volunteered to create a site, it is up and running, and Dennis and I are working hard to continue to populate it with information that can help. Maybe this is one of the reasons I got this mysterious neuropathic condition, and I am just a part of a bigger plan. You just never know, do you? 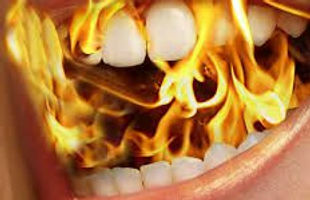 Click Burning Mouth Syndrome (BMS) Support and look around. Contact us if you have links to articles, to videos from YouTube or Vimeo, or suggestions for things that can help, or that you think could have helped you when you were first experiencing BMS. We look forward to sharing this “Something New” with you!